Multiple video recording resolutions of 1080P/30fps,720P/60fps,720P/30fps helps capturing the memorable moments with your families, or exciting moments in extreme sports with your friends. Perfect Full HD 12MP and 150° wide-angle lens gives you a fantastic clear and wide-angle shooting experience. This new camera can be used as a Car DVR, so you can record everything happens in the riding. 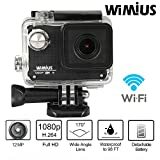 The mini video camera suits perfectly in most of extreme outdoor sports, such as skydiving, running, climbing and so on, and water-resistant up to 30 meters deep allows you to film fascinating water sports, such as diving, swimming, skiing, skating and boating. With the built in Wi-Fi remote control, you can operate or review via Android or iOS Devices. Wi-Fi remote control within 10M, you can control your camera easily at anytime and anywhere. Under the following functions, it can be used as a Car Dvr. Motion Detect: When the camera is turned on, it starts recording automatically when a motion is detected. Looping Record: Record and save videos every 1/3/5min, the last video will overwrite the oldest video when micro card is full. G-Sensor: Turn on the G-sensor during looping record.When the camera is shaked,the recorded video will be locked and saved into EVENT file so that the video is unable to be overwrited automatically. Warm Notice: If using it as an action camera, pls turn off the above functions. This entry was posted in Discount Photography and tagged 1080p, Action, Black, Camera, Full, Helmet, Sports, Waterproof, WiFi, WiMiUS by Ball Photo. Bookmark the permalink.